My 1960 JAWETTA model 551 - original and un-restored. Click to read the story of this moped. Welcome to my web site, which is dedicated to the mopeds and lightweight motorcycles produced in Czechoslovakia, and later Slovakia, and sold world wide under the names JAWA and BABETTA. 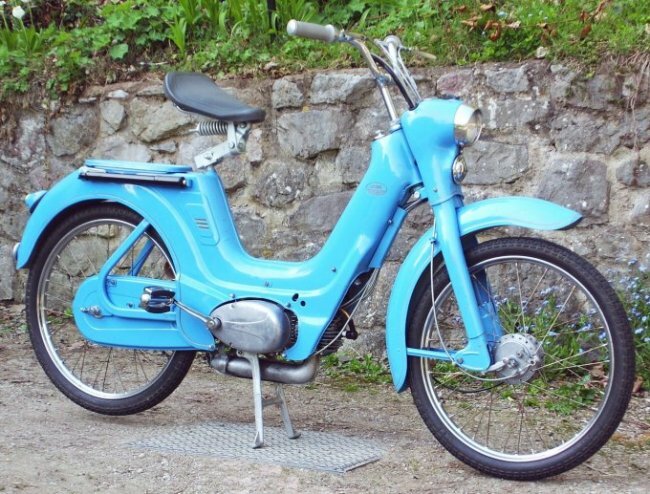 Also included is some information on some other brands of moped produced in Czechoslovakia. I am John Woods and I live in a rural part of North Wales, in the UK. I have owned, and been interested in JAWA and CZ motorcycles for some years and I have a particular interest in the mopeds and small motorcycles that were sold in the UK under the JAWA name. I have created this site after receiving many requests for information about these mopeds, from all over the world. I hope that anyone who shares my interest in these machines will find something useful within these pages. The section tabs on the navigation bar at the top of each of the main pages should be self explanatory. The “Manuals” section gives access to lots of books, adverts, brochures and other information, all divided into sections by model type. This site is always changing as I add additional material as I find it. Have a look around and look out for the items that I have added. If anyone has any material, such as photos, manuals, brochures etc. that you think would be a useful addition to the site, please contact me and I will be pleased to include it. Also continue to contact me if you have a specific question not already answered on the site, and I will do my best to help. I have for many years been a member of the Jawa - CZ Owners Club of Great Britain and Ireland, and I edit the club magazine “Torque”. The club, which has been going for over 60 years, exists for enthusiasts of all the motorcycles and mopeds manufactured in the former Czechoslovakia. There are currently around 400 members world wide. The club has an excellent web site with club information, a photo gallery and membership details. Go to www.jawaczownersclub.co.uk and have a look or click here to view a leaflet with full details of the club. Important disclaimer:- I am NOT a professional mechanic, any advise or information within these pages is given in good faith and is based only on my own experience of “tinkering” with mopeds over the years. If you are in any doubt about any technical or mechanical issue, you should consult a qualified engineer. I can take no responsibility if it all goes horribly wrong. !! !